Ok, normally I wouldn’t think to write about something so trivial in the greater scheme of things as new dishes (there’s plenty of blogs out there yakking about daily little nothings, and when I started this, I didn’t want to add to web junk), but I have to make an exception here. 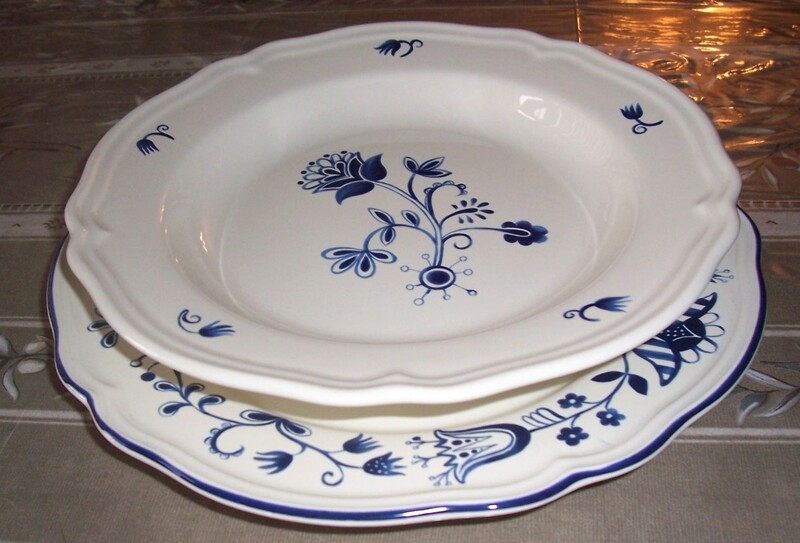 I am absolutely crazy about my new dishes! Over the last week I’ve been checking patterns online, hoping to find the right set – an elegant, old-world set that is elaborate but not too distracting, quality-made but not too overpriced. I mean, we’re talking about dishes here! I can’t believe Versace place sets are selling for $500! – for those of you who don’t know what a place setting is, that is really only 4 dishes – a dinner plate, soup/pasta plate, small plate, and maybe something else. No matter how pretty a setting is, dishware at that pricepoint is going to be extinct pretty soon. Not even really rich people value dinner china over big-box electronics and fast cars. 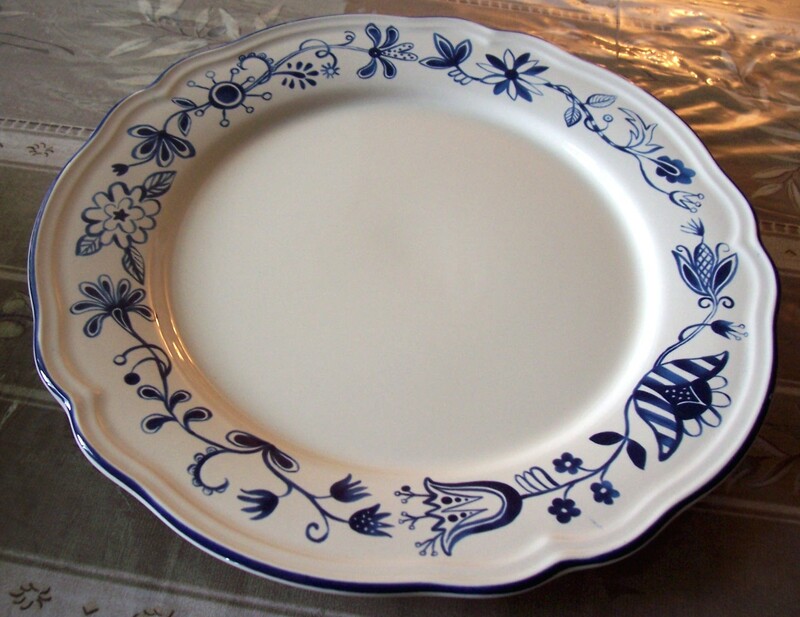 Grandma’s expensive made-in-England china will soon find its way onto ebay. I normally really, intensely dislike Ikea. Other than a pair of bookcases, I pretty much can’t stand their stuff. Until now. My web search narrowed the field down to their set, and I fell in love at first sight. I was intrigued enough to go down to Ikea (and have some excellent meatballs and garlic bread while I was there, to soften the irritation at having to be there). In person, the dishes were even nicer. This is the prettiest set I’ve ever seen: the Arv Idyll collection. I only photographed half of the dishes, but trust me, the soup bowls and side plates are just as pretty. And knowing my luck, they’ll be getting discontinued soon. So I loaded up. It’s the first set I ever get to pick – all of our other dishes from before were gifts, and while nice enough, I never really liked what we had. But we felt guilty getting rid of them. Well, until now. My inspiration was the discontinued Bokhara set by Wedgwood; I wanted to find something just as evocative, but at a more reasonable pricepoint. And now, here they are. So, good riddance to the old dishware, and hello to my new and perfect plates! And the best thing other than their look – they’re made in Portugal, NOT China! Of course, I may be fooling myself thinking that simply because of that I’m saved from lead poisoning…LOL, time will tell. This has been one colourful Olympics. For every glorious moment of well-deserved glory for winning athletes, there was a hissy fit, temper tantrum and otherwise classy behaviour from others not quite caught in the Olympic spirit. Taekwondo athlete Angel Matos of Cuba faces a lifetime ban after kicking the referee in the face following his disqualification in a bronze-medal match Saturday at the Beijing Games. Matos’s coach Leudis Gonzalez also faces a lifetime ban in response to the incident that took place at the end of the men’s over-80 kg bout. Abrahamian threw down his 84kg greco-roman bronze in disgust after his shot at gold was ended by a decision denounced by the Swedish coach as “politics”. Abrahamian took the medal from around his neck during the medal ceremony, stepped from the podium and dropped it in the middle of the mat before storming off. The Swedish wrestler had to be restrained by team-mates earlier as a row erupted with judges over the decision in a semi-final bout with Andrea Minguzzi of Italy, who went on to the take gold. Abrhamian, who won silver at the Athens 2004 Games, shouted at the referee, then went over to confront judges, angrily throwing off the restraining arm of a team official. Swedish fans booed loudly as the judges filed out of the arena. Abrahamian said nothing to waiting reporters but whacked an aluminium barricade with his fist as he left the hall. Abrahamian was eventually stripped of his bronze medal by the IOC because of this tantrum. I have decided to remove this particular entry because it is time to put this incident to rest. The golden Olympic opening ceremonies was somewhat tarnished by news accounts that some of the fireworks had been computer-added to the program we all saw, and that the pretty little girl in the red dress who sang so sweetly was actually lip-syncing, with the original pre-recorded child singer deemed “too ugly” by the Chinese program directors, because she had a missing tooth and buck teeth. Ok, I know a lot of people are saying in defense of the Chinese “Asian kids are much smaller than Western ones”, but let me tell you something. I taught kids in Korea for a whole year, and I did travel to China as well, and I’ve never taught a sixteen-year old who looked that young. From my guestimate as a teacher in Asia, three out of the six girls are 12 or 13 years old. Boxing officials were battling to contain a major scandal on Saturday as serious claims of bribery and the manipulation of Olympic judging panels emerged after a series of disputed bouts. The International Boxing Association (AIBA) suspended Romanian technical delegate Rudel Obreja after he held an impromptu and rowdy press conference and made lurid allegations against senior officials. AIBA also revealed that it had been tracking “possible attempts of manipulation” for more than two months and had brought in an International Olympic Committee (IOC) observer “when the situation became more serious”. Because of sloppy platforms and mishandling, a 26-year old woman who was supposed to perform a 2-minute solo dance at the Olympic opening ceremonies, a prize-winning and talented top Chinese dancer, fell and broke her back, resulting in complete paralysis from the waist down. Apparently she had laid in agony for 50 minutes while the emergency medical crew had to endure a lengthy security check. One wonders if more immediate attention and packing of her back in ice could have prevented to extent of the damage. At first this story was given the usual sanitized Chinese cover-up. But as more stories emerged about the young Mongolian woman who came from nothing, and for whom dance was everything, the media picked up on it. The photo shows the brave face Liu Yan puts on as she wishes the best of luck to her country’s athletes. You have to hope that the Chinese government will be prepared to pay for her lifelong care, rehabilitation therapy and give her a generous pension. You just have to hope. Two frail-looking Chinese women in their late 70s have caused a storm in China by applying to protest during the Olympics. They’ve embarrassed the Beijing authorities and so earnt themselves a one-year sentence to re-education through labour for disturbing the public order, and that’s even before they got a chance to actually protest. Their case has led to criticism that the so-called Olympic protest parks were never intended to allow people to demonstrate during the Games. In an interview, neighbours Wu Dianyuan, 79, and Wang Xiuying, 77, said they had not received compensation after their homes were demolished by the city government seven years ago and were simply fighting for their rights. In an interview, Wang (who is blind in one eye) and Wu were seated together in a ramshackle one-room apartment without electricity in which Wu now lives after her home in central Beijing was demolished to make way for a development. “We have done nothing wrong,” said Wang. Thankfully, after all the media attention, their sentences have now been suspended, on the condition that they “behave well”. Read: no more protests for grandma. Many of China’s security measures at the Olympics seemed to be symbolic threats, aimed at sending a strong warning message, rather than having any practical purpose. Why did China park an armoured vehicle outside the main Olympic Press Centre? Why did police walk through the crowd at Ditan Park last Sunday, taking photos of every citizen who was watching the closing ceremony on giant outdoor screens? Ditan Park is an ordinary park, not an Olympic venue, and nothing except the large television screens had any connection to the Olympics. Why did the police need to photograph everyone at the park? I am leaving any other Olympic scandals that come to mind to the readers’ vote – what other dark moment sticks in your mind as an embarrassment to the Beijing 2008 Olympics? Please feel free to contribute your suggestions. Berlin 1936 = Beijing 2008. I bet Leni Riefenstahl is rolling in her grave wishing she could’ve gotten a crack at filming this one. How are they similar? In both cases, a hopelessly corrupt IOC awards the Olympic games to a savage totalitarian state, while the world turns a blind eye to the atrocities committed by that state. Violations against open discourse started early: as foreign journalists began converging on Beijing to cover the Summer Olympics, restrictions began to be placed on journalistic freedoms. Since China was awarded the Games, China’s Communist Government and the International Olympic Committee (IOC) have continually given guarantees to the world’s media that journalists would have unrestricted access to the Internet. Then, the Chinese Government blew that commitment into disarray when 20,000 journalists covering the August 8 – 24 Games in Beijing were told they would be blocked from accessing some Internet sites. China has also designated 3 parks in Beijing for “sanctioned demonstrations”, promising that there would be room for protests, provided that those planning to organize a peaceful protest would submit a petition in advance. The result: people were rounded up and arrested instead. No protest ever took place. Australia’s Media Alliance spokesman Christopher Warren was quoted as comparing the upcoming Games to those hosted by Nazi Germany in 1936. “This promises to be the most restricted Olympics, in terms of reporting the Games and its social and political context, since Berlin in 1936”. Everyone who has watched the Olympics has witnessed pro-Chinese cheating, none more evident than in the gymnastics fiasco. Not only are at least two of the girls underage, but in my opinion it’s pretty clear the judges have been bought. Not surprising, though, since the field of gymnastics, like figure skating, is notorious for bribing and buying of judges. China has spent in excess of 43 billion dollars (yes, you read that right) to showcase their superiority over (and shame) all other nations who have ever hosted an Olympics. You can rest assured that the message “We’re Bigger, We’re Better” does not stop with the theatrics of the opening ceremonies, to dubbed musical productions or with little girls who are considered too ugly to represent China and must sing below a stage. The smoke and mirrors that cover an insatiable urge to beat all others will not put all its hopes on the shoulders of mere human beings. Just think about it – if you’ve gone all the way and spent 43 billion dollars on a show, what’s a few more paltry million to buy off some judges? This is a country where you go to jail if you speak out against the regime. Where ethnic and religious minorities are persecuted and murdered in the open. Where you must fit in, must not think for yourself, must become a robot for the State. Communism and fascism are similar in that way: they curtail the freedom to be an intellectual, to have free thought, to breathe without looking over your shoulder. They curtail the kind of music you can listen to, the kinds of magazines you read, the choice of vocation, job, and career you may ever have dreamed to have. These are nations where children with aptitude are kidnapped from their parents and thrown into provincial facilities where they are forced to train for 16 hours a day, just to show the State as powerful and full of glory. Gold medals are stacked upon the broken bones, wilted minds and ruined bodies of young people. You can also count on the fact that pre-Olympic discussions took place, where Chinese judging officials have been not only bribed with better apartments and salaries, but also warned that if they brought shame upon China (by marking them less than anyone else), they would be deported to some gulag somewhere and would wish for an early death. You think it can’t happen again? Guess what? It’s happening already.